Marvel taps into nineties nostalgia to promote its next film. Marvel's promotional website for its latest film, Captain Marvel, will either fill you with a warm nostalgic glow, or serve as yet another reminder that you are now very, very old. 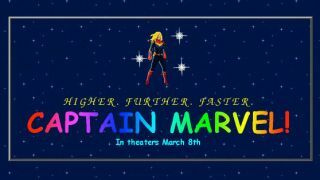 In line with Captain Marvel's 1995 setting, Marvel has launched a retro website that tells you everything you need to know about the upcoming superhero movie starring Brie Larson. That's as long as you're willing to navigate your way through an old-school website layout and eye-straining font choices. For visitors who grew up on a diet of Pogs and Tamagotchis, the website is a charming throwback to an era when accessing a website meant that you couldn't make phone calls. Meanwhile, younger visitors will get a kick out of this glimpse at the archaic aesthetics that 'old people' once enjoyed. Familiar elements from the internet of yesteryear include a guestbook, hit counter and a modem-crippling amount of animated text. All it's missing is a flock of flying toasters. However, in terms of promotional design, this website is so bad it's good. Some of our favourite touches include the old lady Skrull who pops up every now and then – visitors can click to punch her in the face. The ancient Windows Media Player and underwhelming quiz are sure to raise a smile too. And while it might look like zany fun on the surface, this site is practical as well – a 'get tickets' button is in prime position when you land on the page. Tongue in cheek internet killjoy and executive editor at The Verge, Dieter Bohn, has pointed out that this site isn't an exact replica of a nineties website because it clocks in at a whopping 10MB, which would have taken forever to load on the era's 28.8k modems. He also highlights the fact that its guestbook is filled with references to events that happened after 1995. This doesn't ruin our enjoyment of the site though, especially when you learn that the whole thing was built in FrontPage and hosted with Angelfire.